Yes, Virginia, there really is a Hegyeshalom! Note: This is the rest of the story about my train trip to Slovakia in 2001, but I inserted it into the Hungary section because of the central role of the border town mentioned in the title. 16 years after it happened, I’m still amazed that I made it through and didn’t give up train travel! Enjoy! Living in Heidelberg, Germany, during the summer of 2001, I traveled a lot by train – France, Switzerland, etc. I thought I had gotten pretty good at it, so when my company granted a three-day weekend in early July, I decided I would try going somewhere in Eastern Europe. The destination? Bratislava, Slovak Republic. Why? The US Ambassador visited my company and said it was Great! So while my friends were doing Budapest and Prague, I thought I’d do something different. I booked my train ticket to depart on Thursday evening — start in Heidelberg at 2012, transfer in nearby Mannheim at 2032, express train to Munich for midnight, sleeper car to Vienna at 0700, then a short morning ride across the Danube to Bratislava, arriving about 0900. ‘Too easy’, I thought. I couldn’t have been more wrong, and the trouble started early. The Heidelberg train was way late and I missed the Mannheim connection. I now know the true meaning of the word, “forlorn” — racing up the stairs at full speed, with baggage, only to watch the back end of your train slowly, defiantly, pulling away. Furious, I went to the Mannheim ticket office to complain. Keeping my frustration level in check was difficult enough, but my German was poor and the agent’s English wasn’t good. He produced a new itinerary that got me to Bratislava three hours later, but there were downsides: more connections, no sleeper cars, and I had to wait in Mannheim 90 minutes more. I thought about giving up. I was still only minutes from home. But I took it. The clerk shrugged his shoulders. He’d never heard of it. How encouraging. After 90 minutes of putzing around, I hopped the train to Frankfurt, and on to Nürnburg, arriving at 2AM. By then, I was bleary-eyed. I didn’t sleep well. The next leg was a night train direct to Hegyeshalom, I hoped I could find a comfortable chair and get at least a couple good hours of shut-eye. This train was packed with young hostel-hopping students heading eastward, each carrying backpacks with all their worldly possessions. On board, I found every cabin completely filled… except one. The last car had a cabin with only one passenger, a rather ungainly looking man. I was so tired I didn’t pay him any attention. After the conductor checked my ticket, I prepared for a much-needed nap. Then his body odor caught my attention, causing me to give him another look. He was grotesquely overweight, wearing just a ragged white T-shirt, oily blue jeans, shoes with toes missing, and an omni-directional hairdo. The cabin’s garbage can was full of empty beer cans and a whiskey flask. He argued with himself a bit (in German), and ensured I was aware of every movement of phlegm through his sinuses. I tried to ignore him by turning my body away, but to no avail… every snort he emitted awoke me. He began working on his second whiskey flask. Pretending to go to the bathroom, I tried again to find an empty seat elsewhere. But the train was so full, passengers were sleeping in the aisle. ‘This is awful,’ I thought, ‘I’m going to be worn out by the time I get to Slovakia, if I make it.’ Disgusted, I returned to my seat, finally dozing off. We crossed the Austrian border at 4:30AM, and the conductors performed a routine check of tickets and passports. One opened the door and nudged me. Like a robot running on automatic, I produced my documents without achieving consciousness. He thanked me, and let me return to slumberland. But when the other man didn’t awaken, the conductor turned on the light. The response was one of outrage, and the man delivered a stream of alcohol-induced idiocy (thankfully all in German). The smell of his breath hit me like an ammonia inhaler. The two men spent a good minute shouting at each other, with me in the middle. I had enough. I was ready to join the corridor dwellers! After the conducter left, I found an empty cabin and immediately claimed it. I finally got some sleep. The train pulled into Vienna at 7:45, and the conductor began shooing everyone off the train. I protested, “Wait a second! This train was supposed to go to Hegyeshalom!”, showing my itinerary. The conductor simply showed me toward the door, past a couple Austrian Gendarmerie showing a lot of interest in the cabin (and the ‘gentleman’) I earlier abandoned. Boarding the train to Budapest, I figured the worst was behind me. My sense of anticipation had returned. Within minutes, I was at the Hungarian border. Without asking questions, the Austrian and Hungarian authorities stamped my passport, and train resumed its journey. I was then joined by a hostel-bound couple, a Dutchman and a Swiss lady. They were very pleasant, and we got to chatting. I asked them if they knew where Hegyeshalom was, but they’d never heard of it, so they pulled out their roadmap. The name was written in the smallest font, its letters partly obscured by other graphics. Hegyeshalom was a crossroad town toward Budapast. 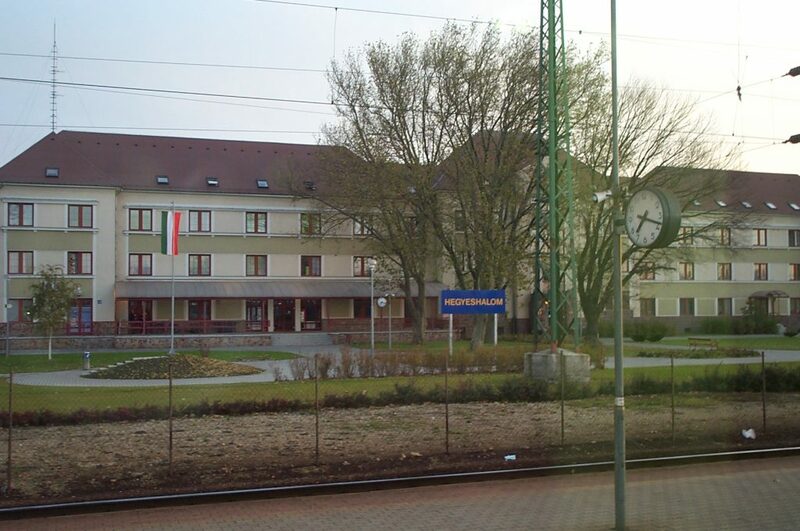 From there, westbound trains moved to Vienna, northbound trains to Bratislava and Prague. It was a very indirect route – we were headed south, but Bratislava was to Vienna’s northeast. The thought crossed my mind that I should just continue on to Budapest, but I had no Hungarian money, and didn’t know if I could charge a ticket from the conductor. After passing twenty minutes worth of farmland and a railyard that hadn’t been fixed up since the 19th century, we reached Hegyeshalom. The station building appeared brand new, but I saw no buildings behind it, just a row of old houses. I bid farewell to the couple and disembarked, eager to find the timetable for the (hopefully) final leg of my trip. The timetable was a handwritten list tacked to an old-style bulletin board. Bratislava Hlavna Stanica (main train station), 11:30… an hour and a half later. Criminy! I would have been in Budapest by 10:30! I couldn’t believe my luck! In between questioning the wisdom of this voyage, I was questioning my own sanity. I sat on a bench outside the building waiting for the rush of anger and frustration to subside before sorting out my next move. I thought about getting something to eat, but the station was unfinished and the restaurant hadn’t been built yet. So instead, I took a walk. Hegyeshalom was a small farming community, a neatly arranged grid of old-style stucco houses. It had little to offer the tourist – there wasn’t the usual confluence of stores and cafés near the station, nor were there any people or cars moving about. For an early Friday morning, I thought the place was unduly quiet. Venturing out, I encountered a number of small town folk — people who worked hard, lived simply, and sought nothing. They didn’t seem to mind strangers. Although the greetings were rarely more than a gentle nod, I felt welcome. That’s when the train came to a slow halt. I was at the Slovak border crossing. The Hungarian agents went through the train quickly, stamping my passport without asking questions. Then came the Slovak immigration agents. They stamped my passport and entered my name into a handheld computer, but asked no questions. But as they departed, they gave a knowing nod to the hidden man behind them… the customs agent. I surrendered it and watched as he … Angrily! Flipped! Through! Each! Page! He held it tightly between his hands and gave one of those dramatic pauses designed to make someone uncomfortable. It succeeded, but I kept my composure. He asked me a question that, in his thick accent, I couldn’t understand. Then he repeated his question in a shout, one syllable at a time, “AN-EE AL-KO-HOL OR ZIGG-A-RETTS?” I calmly answered while maintaining eye contact, “No sir. No alcohol, and no cigarettes.” He tried to stare me down, but as tired as I was, I didn’t flinch. I returned to my seat, and sat on my hands. Tired, hungry, and worn out, I reminded myself that I could have bailed out and gone to Budapest, or stayed in Vienna, or quit when I was back in Mannheim!!! I was so deep in thought that the movement of the train surprised me. Looking out the window, I saw a highway and the border crossing point. A large white sign, titled “SLOVENSKA”, followed displaying speed limits… I was in Slovakia. Thirty minutes later, I arrived safely at the Bratislava Hlavna Stanica. Bratislava was a wonderful place. That afternoon, I visited the brand new Slovak Presidential Palace, toured the famous Bratislava Castle, ate at the Kavarian Bystrica restaurant on the Novi Most bridge, and made the torturous climb to the massive Slavín World War II Memorial. I also cruised the entire old town – densely packed with people, sidewalk cafés, and embassies. The massive city wall still surrounds it. I visited a few museums, where I learned much about Slovakia’s prominent role in the old Austro-Hungarian Empire. Everywhere, the new Slovak flag flew proudly. I enjoyed the second day in the small town of Trenčín, only an hour-long train ride away. I visited the Trenčíansky Hrad, an old Magyar castle perched high over the city. The town square was full with locals enjoying a relaxing sunny Saturday afternoon. The food and drink were both inexpensive and excellent, and the people were genuinely friendly. I believed I was the only visitor there — I saw no busloads of tourists. I wanted no more surprises, so I went to the train station to verify my Sunday itinerary before retiring. The master schedule showed three trains leaving for Vienna at 6:30AM, 9:30AM, and 11:30AM, confirming my original itinerary. I planned on taking the 6:30. Sunday morning came. I checked out early and was at the Hlavna Stanica by 6:10AM, eager to have a relaxing breakfast before my departure. But one look at the board told me something was wrong. The 6:30AM train to Vienna wasn’t listed. In fact, the board showed trains departing up to 10:30AM and the 9:30 train wasn’t there either. The only international train was headed to Budapest at 6:15, all the others were Slovak regional trains. I re-read the master schedule… the 6:30 to Vienna was still posted. I was confused. I walked briskly to the ticket window, where the agent spoke little English. After confirming with her that there was no 6:30 train to Vienna, I asked her when it was. She flipped through a book, wrote the time down on a slip of paper and showed it to me… 11:55. I said, “That’s not on the schedule anywhere!” She shrugged her shoulders as if to apologize. I thanked her and left. I stood in the center of the train station, staring back at the board, cursing my luck. I thought for a moment of what I would do for those five-and-a-half hours. The lights began to flash on the board next to the Budapest train, signaling its arrival. I raced back to the ticket agent and asked her if the train stopped at Hegyeshalom. She nodded yes, and I immediately asked for a ticket. She looked at me quizzically, but I repeated, “Hegyeshalom! Yes!” Thankfully, I had retained enough cash to pay for it. I took the ticket, grabbed my bag and make a beeline for the track. I wasn’t going to be ‘forlorn’ this time! The conductor blew his whistle just as I threw myself into the car. I quickly made sure I didn’t drop anything, like my passport. Heaving a sigh of relief as I verified all my documents were present, I took a seat in the cabin, all the while wondering if I really knew what I was doing. The border crossing back to Hungary went smoothly, and at 7:50AM I was back at Hegyeshalom. I walked to the main board, located right outside the station entrance, hoping I didn’t strand myself. Train to Vienna, the “Dacia Express”, departing at 8:02 AM, Track 1. From there, everything went like clockwork. The Dacia Express was on time, arriving at Vienna Wastbahnhof where the follow-on train to Salzburg was waiting. I made another immediate connection there to Munich, and finally from Munich to Heidelberg. I walked in the front door of my house at 6:15PM, where I threw up both hands in victory! (And relief, of course!) I got a good night’s sleep, and went to work Monday morning as if I’d had yet another routine weekend trip. As I thought back on my misadventure, I realized I had learned a lot of things. I didn’t really wind up in Hegyeshalom. God had sent me there, for multiple reasons. First, and most obvious, if I didn’t get misdirected on Thursday night, I wouldn’t have known what to do in Bratislava on Sunday. I wasn’t as well prepared as I thought I was, and vowed not to repeat that mistake. On all subsequent trips, I ensured I had viable alternate plans. I’ve never again been bothered by missing a connection. Next, if not for Hegyeshalom, I’d have paid all my attention to the pretty buildings in Slovakia and not enough to the people. Nowadays when I travel to new places, I make it a point to include something ‘indigenous’ – go off the beaten track, visit their towns, read their history, eat their food, and go where they go. I enjoy the sense of immersion, because I learn so much more. Finally, I learned the value of perseverance and commitment. In reality, I never faced real ‘trouble’, just a lot of inconvenience. But instead of taking the easy way out, I kept plugging forward. As a result, I got full value for the trip, and a great story that I tell friends over a beer. A few months later, I took a wonderful trip to Budapest. On the way, I made sure I took a picture of the Hegyeshalom train station. That picture now adorns a spot on my wall, a reminder of the most wonderfully awful, and awfully wonderful, weekend I spent in Europe. A footnote. Upon sharing this story with my co-workers, my boss asked me if I knew what Hegyeshalom meant. He wondered if there was some happy theme that could enhance the story. He specifically pointed to the inclusion of ‘shalom’ in the name, which means ‘peace’ in various languages. I quickly surfed to a website that included a Hungarian-English dictionary and found that Hegyeshalom is indeed a compound word: “Hegyes Halom” literally translates to “Mountainous Pile”. (Don’t believe me, check it out for yourself.) For the sake of the denizens, I hope I missed something in the literal translation. I welcome anyone’s second opinion.